We mentioned this event some earlier in announcement, but what is "ParaGamesBreda"? ParaGamesBreda is a unique event within its borders has a different uniqueness, people with disabilities can exercise their own level, with and against others, with the motto "Sport without borders" and the vision in line with the principle of "Normally what normally, especially in relation to special needs.". Games are held every other year and experience a fantastic expansion. 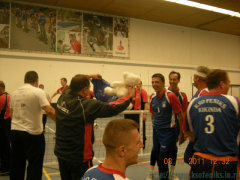 First held in 2005-and as a modest sporting event, but already in their third edition in 2009 there were more than 2.000 participants, and this year is even planned to have 3.000 participants from 40 countries. Thus, the game leads into an attractive and high-grade ranking, but also with a relatively low cost of participation! The future aim of ParaGamesBreda is to provide a platform for athletes with disabilities where they can work at their own level. 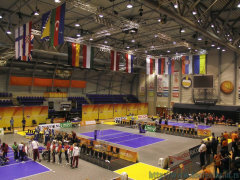 This is done by maintaining a multi-day sporting event in Breda (The Netherlands) for people with disabilities, including domestic and foreign participants. ParaGamesBreda has the ambition to grow into a foundation that organizes a sporting event where 50% of the sports offered the status of an elite international tournament in which a ticket for the Paralympic games can be achieved. The games are certified by the International Olympic Committee. So, it seems as serious, very strong tournament, with the clubs we know nothing about. A big challenge. The following is a sad story with a happy ending. Already by this spring the leaders of "Feniks" had a decent sweat to provide funds for this road and to provide flight tickets as early as (read it: as cheaper as) possible, as well for the other costs of this, so far the longest, Feniks road. A bunch of problems, not worth even mentioning, is somehow resolved and payment of low-cost flight was made in late of June. Much later we realized that this was, practically, a point of no return. By mid-September it seemed that everything was under control. Our Murinyo threw all the cards on the timing of form for this tournament. He corrected the tactics of the game, developments in the field, devising new actions, speeding up the game, we trained hard and practiced it all - for Breda! Matches of the first two tournaments of Serbian championships for 2011th fit well into this plan. 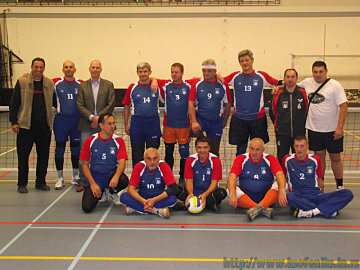 Then came e-mail with the disappointing news: a lot of clubs canceled participation in the competition "because of the demands of players who play for national teams at the European Championships, which will be held from 9th to 15th October 2011 in Rotterdam" (see details). We knew for EC, if no other way - then by the fact of which we are particularly proud of: our captain got an invitation to the national team (and, of course, accepted it) from the national coach of Serbia. But also, everyone else knew it and still they gave up in the last minute (!?). There followed a question from operating organizer Mr. Jaco Spa: "Do you accept to come and play in such circumstances, with the chipped number of participants?" The answer was yes, as befits all real athletes, and of course it was not without interest and commitments to institutions that have helped us. 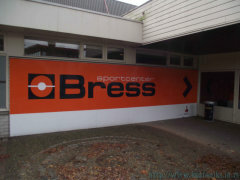 So we found ourselves at the sports center "Bress" at the scheduled time. The games were with the fighting, and the see-saw in the results, the excitements, suspenses, nice moves, mistakes, trained new and old shares, and sets with a score of 32:30 ... and everything that this sport can offer. Feniks has given it's best and won this tournament! Such as it was. It's hard to believe in what follows below in this sentence, but it is an indisputable truth that we would much prefer a, say, won a bronze in the full composition of the tournament. I would not spoil this success by the facts and details about the disastrous tournament organization and the things alike. 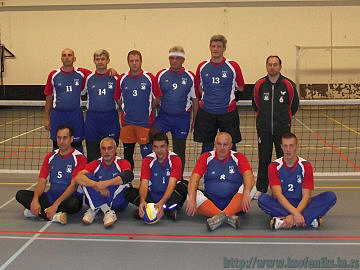 KSO "Feniks" won the first place in the sitting volleyball tournament in the fourth edition of "ParaGamesBreda"!!! Sitting: Anđelov, Budurin, Golijanin, Setorić, Budinčić. Sede: Anđelov, Budurin, Golijanin, Setorić, Budinčić. Nothing succeeds so well like success itself! And to repeat the success - it must be celebrated! In this aspect, as in everything you can think of in this story, Dr Eddie Igaz, PhD, has helped us, together with his wife Marthe and their friends Krasni and a couple Jelena and Pera. They were with us whenever it was needed and much more. 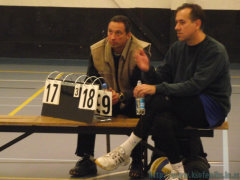 For the uninitiated - Eddie is our most excellent, old friend, former Kikinda inhabitant, volleyballist, gymnasticist, tennis player and a lot more, and as a tennis coach he was working with Zimonjić, Nestor, Troicki, Bupathi, Kournikova, Kafelnikov, Bjorkman, Krajichek, Henmann .. . and some of which are yet to be heard. For more words about him and his present job you can find here i here. 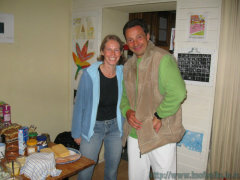 Mr. Josef Banfi is the eternal enthusiast, one of the key people in Europe concerning this sport. 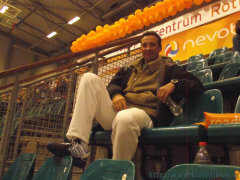 Thanks to him the next day we had a chance of not to be missed: we watched the the first day matches on EC in Rotterdam -LINK- and passionately cheering for our team in the match versus Russia. 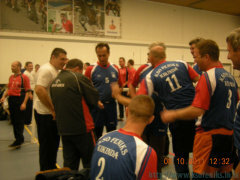 A member of the "Feniks", Dragia Brandić, by the entries from the bench contributed to the national team game. Unfortunately, the Serbian national team failed to make a significant success, but there will be recorded a nice, strong and constant cheering for the national team of Serbia and their gratitude for support.